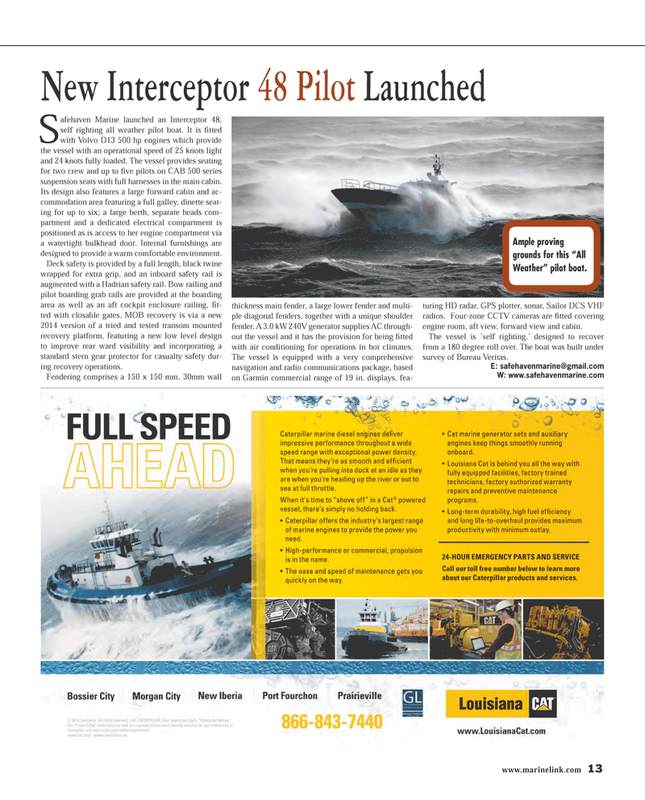 S afehaven Marine launched an Interceptor 48, self righting all weather pilot boat. It is fi tted with Volvo D13 500 hp engines which provide the vessel with an operational speed of 25 knots light and 24 knots fully loaded. The vessel provides seating for two crew and up to fi ve pilots on CAB 500 series suspension seats with full harnesses in the main cabin. Its design also features a large forward cabin and ac- commodation area featuring a full galley, dinette seat- ing for up to six; a large berth, separate heads com- partment and a dedicated electrical compartment is positioned as is access to her engine compartment via a watertight bulkhead door. Internal furnishings are designed to provide a warm comfortable environment. Deck safety is provided by a full length, black twine wrapped for extra grip, and an inboard safety rail is augmented with a Hadrian safety rail. Bow railing and pilot boarding grab rails are provided at the boarding area as well as an aft cockpit enclosure railing, fi t- ted with closable gates. MOB recovery is via a new 2014 version of a tried and tested transom mounted recovery platform, featuring a new low level design to improve rear ward visibility and incorporating a standard stern gear protector for casualty safety dur- ing recovery operations. Fendering comprises a 150 x 150 mm, 30mm wall thickness main fender, a large lower fender and multi- ple diagonal fenders, together with a unique shoulder fender. A 3.0 kW 240V generator supplies AC through- out the vessel and it has the provision for being fi tted with air conditioning for operations in hot climates. The vessel is equipped with a very comprehensive navigation and radio communications package, based on Garmin commercial range of 19 in. displays, fea- turing HD radar, GPS plotter, sonar, Sailor DCS VHF radios. Four-zone CCTV cameras are fi tted covering engine room, aft view, forward view and cabin. The vessel is ‘self righting,’ designed to recover from a 180 degree roll over. The boat was built under survey of Bureau Veritas.